This is a guest post from Bob Richards, the publisher of The Retirement Income Blog. Your broker may seem like he wants to help you make money and odds are he does. Unfortunately, he works in a system that decreases the possibility he can help you. 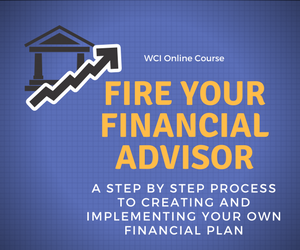 Your broker has positioned himself as your advisor, someone acting in your interest. However, this is not always so. If he works for a large firm, that firm issues his paycheck and he is beholden to that firm. Say he works for ABC Financial. Notice that he often recommends the mutual funds or annuities created by ABC Financial. This allows his firm to not only get a commission when you buy the fund but also fees for managing the fund. So even though there may be better-performing funds he can recommend, he is under no obligation to do so. His legal obligation is only to sell you what is suitable, not what is best. And he often recommends “packaged products” such as mutual funds, annuities, or wrap accounts rather than individual stocks and bonds. It is much easier for his firm to bury high fees in a packaged product. In order to become a broker (now called financial advisors at many firms), one must take a test. The exam is like most exams—you memorize a bunch of information and then regurgitate it. The test is multiple-choice. Any intelligent 12-year-old can pass the exam. In fact, many brokers attend a 40-hour cram course the week prior to the exam as their only preparation. Furthermore, the exam tests knowledge about rules and regulations and almost nothing about what it takes to help you make money. From my experience as a former branch manager for a major brokerage firm, about 80% of the brokers know very little about the market or the investments they sell. The other 20% may have actually taken investment management, economics and finance classes in school but this is not a prerequisite for becoming a broker. Alternatively, the 20% who are knowledgeable may have educated themselves. Your broker sells you offerings he may not understand. Investments come with a prospectus. I have never met a broker who read the prospectus of the investments sold. The way he often learns about the investments is by attending a luncheon given by a wholesaler (a sales person to sales people) who provides the sales talking points for the broker to incorporate in his pitch. Because the broker cannot distinguish between a “good” and “bad” investment, he generally sells what his firm recommends. The way that most registered investment advisors work is that they manage your investment portfolio for a percentage of the assets for which they are providing advice (e.g. 1% of the portfolio value would be $1,000 annually on a $100,000 portfolio). Because of the way they are compensated, they have no motivation to sell you this stock, that stock, that mutual fund or this bond. Their motivation is to retain you as a client and to make your account grow. Only in this way can they make more money from you by helping you grow a larger investment nest egg from which they can collect their 1%. Yet others simply work hourly much like an accountant or an attorney or via a fixed retainer. Again, they have no incentive to sell you the product-du-jour as does a broker. So here’s the advice I’d like to give every investor. Do not buy packaged products because unless you read the 80 page prospectus, you are likely being ripped off in terms of high fees. Buy individual stocks and bonds and no load mutual funds which you must buy on your own because commission brokers don’t sell them. Either deal with a registered investment advisor who will charge you fees and not commissions or you’ll need to learn enough about investing to do it yourself. This is great advice. I always wondered how brokers got away with all of this. You would think they’d have to have your best interest at heart, but that is not the case. I’m sure there are some really good brokers who try to do what’s best for the investor, but most probably don’t. Thanks for your comment Jake. This whole issue is at the heart of the Fiduciary debate and the push for a uniform Fiduciary Standard that applies to all who call themselves financial advisors. Sadly, in my opinion, if Congress ever does enact something it will be watered down and perhaps the investing public will be even worse off. The financial services lobby is well-funded which yields influence. Great advice! I tend to fall back on the saying that the only one who cares about your money 100% of the time is you, which is why it’s so important to know how the advisor is compensated.